Michelle Charles has painted glasses or bottles countless times over the past twenty-one years. No, that is not the way to put it. It’s not about that. The words ‘glass’ and ‘bottle’ come out too strongly in their materiality and facticity, and the word ‘painted’ has no vitality, or suggests a rather mechanical activity. The two players in the equation are not related properly. What actually happens is that the glasses or bottles become light-traps, or light-vessels. Michelle Charles has not yet finished exploring all the possible inflections and subtle nuances that a single, simple object can be invested with. Or, that could be put the other way round. She has shown and continues to show us the extraordinary freedom and inventiveness of the brush stroke that issues from and returns to a single form. There could be a further way of describing it; her works conduct a dialogue between representation and the play of light, a phenomenon fluctuating and wandering, whose immateriality is gathered and condensed or contained in the vessel. The solid object is only held together by the brush strokes which themselves are equivalents for light. Painting had a paradoxical birth. While its subject was often the fleeting, the changeability of things, its actual materials were developed over thousands of years to be lasting and not to fade. In Michelle Charles’ paintings of empty glasses there is a further refinement of this paradox. To render the transparent she must make use of a material that is opaque. How the opaque is transformed into transparency is one of the sources of the magic in her art. The change is not in the material, which remains dense, but occurs in our understanding, our perception. 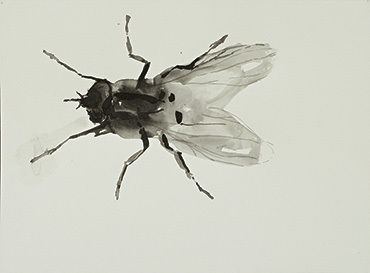 In its simplest form this is seen in her series of single glasses or tumblers painted in ink on paper, one to a sheet. The unmarked paper is clear or empty. It is only the interference in that clarity, the partial coverage of the paper, that produces the sensation of transparency of the glass. This is achieved differently in each painting and never becomes monotonous. In fact the standardisation of industrial mass-production, responsible for producing the identical glasses in the first place, is turned on its head by Charles’ form of serial painting. Her images are ceaseless returns to a source, rather than repetitions. In his painting A Bar at the Folies Bergère (1882), in the Courtauld Institute in London, Manet foregrounds on the bar top a small glass containing flowers. He gives this object a singular identity. It sings out in its clear transparency among the vari-coloured unopened bottles of beer, liquor and champagne, seeming to belong to another order of being. We can compare directly, in Manet’s handling, glass that retains its commonplace functionality and glass that becomes a vessel of light. A somewhat similar experience is given by Michelle Charles’ paintings of single glasses and bottles directly on the covers of old books. There is a similar contrast between the dun colours of the book covers and the delicate transparency of the glassware, often marked by residues of milk or medicine. The first glass object to be painted on a book was a medicine bottle. The books are faded testimonies of intellectual effort, with titles like ‘Studies in Social and Economic Process’, ‘General Science – Part I’, ‘The Nature of Price Theory’, psychoanalytic titles, and so on. Many are superannuated from libraries, retired from an active life, and Charles’ glasses and bottles, in the very freshness of their brushstrokes seem to re-nourish the dwindled intellectual energies. She achieves a deftness – a light touch – which cannot be equated with slickness or virtuosity, which draws no attention to itself, which is close to life. These painting-objects are marvels of tenderness. When we speak of ‘seeing’ we often forget the time element involved, for example the difference between prolonged contemplation and the brief glimpse. There is the brilliant insect that is gone in a flash. We have only a second to admire it, and that perception is qualitatively different from having hours to study the same beetle stuck on a pin. Michelle Charles moved back to Britain seven years ago, having lived and worked in the United States for the previous two decades. New York and London still exert contradictory pulls upon her: ‘When I’m in one I want to be in the other’, she confides. Yet this dual allegiance appears to have been remarkably beneficial. Her New York paintings have a decisive directness which it could have been hard to acquire in Britain: they are fuelled by the proximity of Abstract Expressionism, and the focus on commonplace, everyday objects associated with Pop. At the same time, if one compares her series of glass paintings over the years, a certain American ruggedness and monumentality has ceded to a subtlety and ambiguity which perhaps can be attributed to English light and sensibility. Her recent paintings induce an unmistakeable feeling of calm, they feed and calm us with an effect something like the milk or remedy whose traces remain in the glass. Yet at the same time, paradoxically, they re-vitalise the handling of paint to a degree that has become extremely rare in contemporary art. They rekindle the active, reciprocal relationship between paint and the ‘thing’ painted – an extension, really, of the sense of touch – whose quality has been lost in the avalanche of photographic and digital imagery. This essay was published at Kettle's Yard, Cambridge in conjunction with Solo show.